Since 1999 ely restaurants have paved the way for great wines catering to all tastes and budgets. Today in our 15th year, we now have 3 award-winning venues in Dublin and our extensive drinks list offers over 500 wines by the bottle, over 80 wines by the glass and over 50 craft beers – along with great cocktails and spirits. Passionate about wine, we are always on hand to talk to customers about the wine they like to drink and to help educate those who are interested to learn more. ely has always offered the very best in Irish food provenance. We rear our own organic beef and organic pork on our organic family farm in national landmark, The Burren, Co Clare. Our organic lamb comes from our good friend and neighbouring farmer. We use only locally produced seasonal ingredients. Everything is traceable at ely. If we don’t know where it’s from, you don’t get it. ely wine bar at 22 Ely Place, is an intimate elegant setting in the heart of Georgian Dublin. Located just off St. Stephen’s Green, this iconic wine bar is not only loved for its extensive and great value wine list but for its fresh flavoursome Irish food. The Georgian drawing room is available for private dining and wine tastings, while the downstairs cellar bar is the coziest spot in Dublin to enjoy a glass of wine and while away the hours. ely bar & brasserie, located in Dublin’s Docklands, is Ireland’s oldest wine venue. The original 1871 cellars, now with 2 fully licensed bars and a heated waterside terrace, have been transformed to become the architecturally beautiful venue it is today. Guests come to enjoy a fantastic combination of wine, craft beer and cocktails with fine Irish food. The stunning cellar vaults can accommodate functions for up to 250 guests. ely gastro bar overlooks the glistening waters of the Grand Canal Basin. 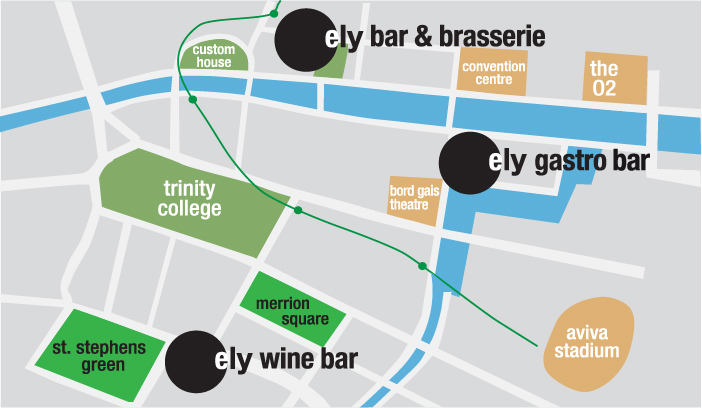 In the heart of the action, ely gastro bar is conveniently located beside theatres, stadiums and concert venues. With 50 craft beers, 150 wines and real gastro bar food, ely gastro bar offers smooth food and laid back ambiance in one of Dublin’s trendiest spots.